To respond to the Do Now U, you can comment below or post your response on Twitter. Just be sure to include #DoNowUDiet and @KQEDedspace in your posts. How do we choose what to eat? You’ve probably heard that you need to eat a balanced diet to maintain a healthy lifestyle, but what exactly does that entail? Americans are bombarded with many food choices every day, from mainstream fast food restaurants, to endless aisles of food in grocery stores, to infomercials hawking the next weight loss program. It’s no surprise that there is confusion about what exactly is “healthy.” Though we have access to nutritional food labels and other health information, what should the average American be looking for when it comes to food? As recommended by the United States Department of Agriculture, we should be diversifying our plates with color and nutrition. One option for deciding how to eat healthy is to think of your stomach as a party! Instead of analyzing nutritional labels and meticulously counting calories, you could strive to create the perfect party atmosphere in your stomach. For example, when planning a party, a diverse array of guests will be needed to ensure happy co-mingling. Therefore, you may want to invite that one person who’s always the life of the party (fattening foods), but you probably don’t want too many of these party friends in attendance, yearning for the spotlight. It would be better to complement your party friends with more introverted wallflowers (fruits and vegetables) who stabilize the party atmosphere. This will avoid your party turning into a “rager,” and eventually disturbing your neighbors (or your body)! Many other options for “healthy” diets are presented to us through books, articles and advertisements. The fast-paced American lifestyle lends itself to quick-fix diets that will give the best results in terms of weight loss and overall appearance. An entire industry exists to promote diets that are low-carb, gluten-free or aim to return us to our caveman roots. While some argue that these diets restrict certain food groups and decrease good nutrition overall, others point to cases where individuals have been able to regain control over their weight and their health by using these dietary plans. Everyone has a different definition of a good party. The body works in a similar manner, in which your own body has its own nutritional preferences and needs. It is important to take your activity level, current health status, lifestyle tendencies, and budget into account when deciding what is the perfectly balanced, nutritious meal for you. What influences your dietary choices? Where do you get information about what you should eat? This article discusses the types and amounts of food that constitute a healthy diet, and lists the World Health Organization’s recommendations and the U.S. Department of Agriculture’s Healthy Eating Index. 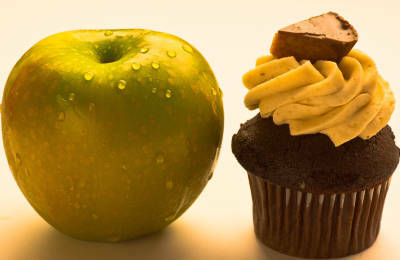 Eating Healthy: Whose Choice Should It Be? Find out why we’re often not aware of the food choices we are making. This article addresses Dr. David Katz’s study of different types of diets – including natural and processed foods – and how they affect the human body. This post was written by Sarah Abney, Ghazal Ahmad, Abby Boyd, Josh Funderburke, Thomas Norton, Erin Oliver, Kiara Smith and Payton Usher, students at Mercer University. As for my eating habits, I try to intentionally invite “wallflowers” to my party since “lives of the party” seem to show up on their own accord! Recently I’ve gotten my information from a registered dietician and books she’s recommended. You make a really good point! It would be better if more people realized that fruits and vegetables can be just as delicious as fatty foods. However, this is just not the case, and the analogy was used to target a common way of thinking. But I do agree, if more people knew how to prepare and create foods with fruits and vegetables in a delicious way, and more mainstream restaurants incorporated this type of food preparation, then it could help address America’s obesity epidemic. Definitely an interesting article. It gave me a quick insight in influence that companies have on us, and how easy our decision making can be influenced – not only food wise but generally. I think that this article is right, but it’s your choice to make it happen to choose what goes into your body not the food. It is definitely up to each individual to make their own food choices, but its not always as simple as “this is good for me, so this is what I will eat.” Healthy food is expensive, for starters. In addition, healthy food can take a lot of time to prepare, so its not always easy for people with busy schedules. I think its important to be kind to ourselves whenever we do slip and make mistakes with our diet, and to just do the best job that we can. We also loved the stomach party analogy! I agree, the ultimate choice does come down to the consumer. But think of how much healthier our choices may be if we weren’t being influenced by different companies to purchase unhealthy foods. Imagine walking into a store that highlights and accentuates the healthy options as opposed to junk food. While we do may make the actual final decision, would we not be more inclined to lean towards purchasing foods that are better for us? Also, if people are more aware of the social cues placed by companies to encourage the purchase of certain foods, there is a lesser chance that they will make food decisions based off of outside factors, like food companies. In today’s society healthy food choices are very hard to find around local markets for the mere fact that we as Americans want to eat food, to make us full, with healthy vitamins and minerals to benefit us through-out the course of the work day. However we are getting tricked into buying ‘healthy’ food options from fast food restaurants like Wendy’s, Burger King, and McDonald’s but the things we don’t know is they are marketing their food by “Food framing” -(Rutgers Today) which is the use of colors, animations, and lighting to help make the food look more appetizing. For example, the American diet is a standard 2000 calories a day including breakfast lunch and dinner, and many people in the morning are in a hurry to get where they are going, so naturally they go to a drive through and get something on the go, and yes the menu inside and outside have the calorie count right next to the foods, but let’s be honest hardly anyone looks at the calories before they buy the item. Then for lunch items like the ‘big mac’ have a calorie count of 540! Including breakfast and lunch that leaves you only 922 for dinner and according to studies done over the year’s dinner is the biggest meal of the day. Not to mention the nutritional value in these fast food joints, their food is basically just carbs and saturated fats, which can lead to serious diseases if you choose to make them apart of your daily routine. “We should up our consumption of fruits, vegetables, legumes, whole grains and nuts.” – Christian Nordqvist said in the article what is Healthy Eating? What is a Healthy Diet? I feel like we have wondered a little far from actually good food, in every direction including the school lunches. They literally took away salt because we were getting too much sodium in our supposed diet. So we were basically eating cardboard for lunch. Then in the kids meals at fast food restaurants they would fatten any kid up with their incredibly unhealthy meal parents would buy to save time. That’s why America is fat because while every other country in has limits we have a gallon of ice tea with 50 chicken nuggets (made out of who knows what) for the very low price of $1.29. I have for the past year been on a diet were some days I actually starve myself it’s called fasting, were for a whole 24 hours you don’t ingest anything at all, it is so that your body can clean itself out for a day and the next day you actually eat with in portions, because your body is still getting used to everything about eating the day after. I’m not saying everyone should fast like me but they should at least learn to eat with in portions of every meal they are given, and just for some extra healthy activity a work out for at least 30 minutes is everything you need for a healthy lifestyle. You are completely correct in the way the food industry causes us to desire certain foods more than others. It is quite a sad predicament that is many ways unethical to the consumers of these goods. While these fast and unhealthy foods are convenient, I think in order to eradicate the issues of these lifestyles both the consumers, work force, government, and business have to make more of an effort to provide healthy choices and change the mentality of diets and exercise. I also think that each person has different nutritional and dietary needs, so while fasting may work very well for you, another person may have to just continue to eat small portions everyday and incorporate water into their diet along with exercise. I do think that your advice however, was very befitting to this article. Thank you. Every day you are surrounded by people, products, and places that all have an effect on how we live out our daily life. We need to make sure that we are surrounding ourselves amongst the best people, places, and things in order to stay healthy, both physically and emotionally. Consumers play a huge role in what we eat everyday as well as making sure we ourselves are maintaining a healthy diet are all a part of what goes into playing a role amongst our dietary choices. It is amazing to see how much of what a producer does with their product and the vast way it affects us as the consumers. According to a video done by Rutgers Today, they talk about food framing. Food framing is when a company uses specific techniques to lure consumer interest. These can include, but are not limited to, presentation, packaging, color of food, and the amount given in a package. This comes to show that we obviously pick up and purchase the things that interest us the most. When we see a colorful package of assorted fruits and veggies we are more likely to pick that up than to buy a bag of carrots or a whole piece of fruit. I can even admit that going to purchase food, I prefer pre-cut fruits or veggies with dip included in it. This is something that all food producers should look into as it plays a great role when it comes to what you eat and how to get everyone to eat better. We must not only see the way things are packaged, but also make sure that what we are picking up is good for us. According to MNT in an article, it says that it is very important to classify a diet as what you consume on a daily basis. You must make sure that you get the proper nutrients each day. The other thing they focused on was not only making sure you got those ingredients, but double checking to make sure they were not processed or stripped of their most influential ingredients. The ingredient they had focused on what wheat and how you need to make sure you get whole grains instead of the just wheat in your food products. Each and every time you head to the super market or swing through the fast food lane, think about how what you are putting into your body has been greatly influenced by those that created it. Also think about what it took for the piece of fruit to land in your grocery cart or those small fries that are now sitting next to you in the passenger seat. It is crucial that we look at these factors in order to make a more informed decision to be a healthier group of people. We cannot force healthier options on others, but we can encourage them to grab these healthy options whenever they head to the grocery store. There are so many things that influence your dietary choices, but it is up to us to make the right choice. I believe one phrase you put perfectly encompassed an important lesson to learn: “We cannot force healthier options on others, but we can encourage them to grab these healthy options whenever they head to the grocery store.” Making unhealthy choices when it comes to food is something many of us are guilty of us, and it can become a serious problem if not kept in check. I’m not a psychologist, but I would almost certainly guarantee that an increase in healthier food choice would occur if someone surrounded themselves with people who encouraged such consumption choices and actively participated in eating healthier foods. It’s important that we understand everyone struggles with choosing healthy foods, so we need to remember to be encouraging of those around us to purchase and consume healthier foods. If we all work on our eating habits together, I am positive that we will begin to make the healthy choice more naturally and subconsciously. What influences your diet choice? deciding how to eat healthy is to think of your stomach as a party! these party friends in attendance, yearning for the spotlight. about it. An entire industry exists to promote diets that are low-carb, gluten-free or aim to return us to our caveman roots. patients all over the world. I feel that the majority of the times, you do have complete control over what you eat. In the video though, they said that you truly don’t have control over what you eat because of the ways the company or dining hall set up and lay their food out. The way you do this could influence you because they could make some foods easier to get or others may stand out more so they appeal more than the other foods that are laid out. If I am wrong and you don’t really have control over what you eat, then I feel that we should be using this to promote healthy eating. If we use this in the right way, we can trick a person into eating healthier, which is much needed in America. America is really starting to become overweight and it is a real problem. If we could get a handle on this, I feel that just eating healthier could really help out with America’s weight problem. “Healthy eating means consuming the right quantities of foods from all food groups in order to lead a healthy life .Diet is often referred to as some dietary regimen for losing weight. However, diet simply means what food we eat in the course of a 24-hour, one week, or one month, etc. period .A good diet is a nutritional lifestyle that promotes good health. A good diet must include several food groups because one single group cannot provide everything a human needs for good health.”( Christian Nordqvist) we could promote all of the food groups that are necessary to a healthy diet and that will help America slim down. I also feel that sometimes the prices can be what steer people away from the healthier foods. Some fruit prices are outrageous. If we could lower some of these prices and offer more sales for fruits and vegetables, there would be many more people going out and buying healthier foods. “We need protein for the building and repairing of tissue in our body. Protein-rich foods also include essential minerals, such as iron, magnesium, zinc, as well as B vitamins. Douglas Paddon-Jones, PhD, Associate Professor, The University of Texas Medical Branch says that proteins should make up about 20 to 25 percent of our nutritional intake”(Christian Nordqvist) Protein is also very important. These help build muscles which is added on top of what was said above. If there are more muscles, then you will have a higher metabolism witch will lead to a healthier life. I hope that people read this and become aware of the tricks that companies can play on your mind to get you to buy something. Overall I feel that this kind of advertising should be used to help promote healthy eating and to help America drop a few pounds. This could be really helpful if it is used the right way. If we don’t get a handle on this and all of the fast food restaurants keep selling their fattening foods, America will just keep plumping right up. I think you’re exactly right that we need to use the power of advertising and “food framing” to encourage healthier eating. I don’t think the idea of “food framing” in the video is that we mindlessly eat whatever is put in front of us without choice (most of us, anyway), but the problem is that it does play a role in how we choose food. And so long as this type of product advertising is being used to promote the purchase and consumption of unhealthy foods, we have a serious problem on our hands. But you’re idea about utilizing these advertising techniques in order to promote healthier eating is exactly what I had in mind. If we can make focus in on making healthy food the subject of “food framing,” it could be the beginning of getting Americans to eat healthier and take better care of themselves! will keep the cops (your body) from showing up. pasta, meats and grains hold a lot of our daily fat. products, and places that all have an effect on how we live out our daily life. places, and things in order to stay healthy, both physically and emotionally. has to digest anything that we consume. Not only that but we need to know what is being package and what we are consuming. What influences our dietary choice? In my opinion, I feel that price is a big factor because most people do not want to pay $7 for a salad and maybe $1 for a cheeseburger. $4 for a water and $1.58 for a soda. I feel that it is absurd. It is crazy about the prices for unhealthy food compared to healthy food.The United States Department of Agriculture said we should be diversifying our plates with color and nutrition. The more color, the more healthy your plate truly is compared to the plates of others with less color. I understand why people think that with more color, the more healthy it truly is, but I do not believe that is completely true. (http://ww2.kqed.org/education/2016/04/06/what-influences-your-dietary-choices/) Let’s take a Mcdonald’s burger really quick, a quater pounder deluxe. It has lettuce, tomato, cheese, etc. on it. Colorful, right? Green, yellow, red. Well it is not healthy because of the meat and stuff on that burger. It will make you overweight. In a long period of time, at least. It is not you eat one burger and you are the show “My 600 Pound Life.” The people on that show have no way of controlling themselves. Their heart is forced to pumped harder because their body produced more veins. The veins of a normal person, I believe, can stretch around the earth one or two times. An obese person is more like four or five. Instead of analyzing nutritional labels and meticulously counting calories, you could strive to create the perfect party atmosphere in your stomach. Why is healthy eating important? When combined with exercise, a healthy diet can help you lose weight, lower your cholesterol level, and improve the way your body functions on a daily basis.You should exericsise an hour a day. I wake up at 2 in the morning so i can work out until 4:30 in the morning. I love working out in the morning because not many people and at the gym that early. I never use to like working out at all until spring break. My friend, his mom, and her boyfriend got me up at 2 in the morning. We would pick different work outs for the different days of the break. Working out never got boring with them. We would push all of our limits until we could not handle it any longer. years now. March of 2013 was the date I stopped consuming any and all meats. pineapple especially! Eating healthy doesn’t have to be “boring” or “lame”. There’s so many cool ways and recipes that you can use fruits and veggies for. include green beans, corn, carrots, broccoli, and lettuce. and see that there’s no secret trick or ingredient to healthy weight loss. does not mean there still aren’t harmful ingredients. Shop smart, not ignorant. are good and bad for them. People know right from wrong. The choices we make in dining halls and in restaurants are greatly affected by the things that producers do. The packaging, the portions and even where the food is available affects our choices. I believe that producers take advantage of the consumer who is easily distracted by the empty promises. Another good example of this is when a food package has noticeable slogans that claim “only 100 calories” or something similar. Most of these foods may be low in calories but are high in unhealthy ingredients. These foods are not beneficial and prey on the consumers who are misinformed about healthy eating. There is no way to stop food companies from doing this, however the answer is to better inform consumers. If the consumers are informed about what they are actually buying, companies will be forced to change their tactics. One more interesting article, which just came across the AP last week: http://bigstory.ap.org/article/f9483d554430445fa6566bb0aaa293d1/ap-exclusive-how-candy-makers-shape-nutrition-science. Food companies (go figure) play around with data to alter our food choices. What influences my dietary choices is how hungry I am and how fast I want to eat. If I’m really hungry I automatically i would rather go to a fast food restaurant for a quick meal. Whereas if I’m not hungry I would wait for my mom to make a good home cooked meal. Honestly, the main things that influence my dietary choices is what I’m craving. I tend to crave different types of food at different times. In addition, some other things that influence my dietary choices is the way food looks. If a sandwich looks appealing on a menu I am more likely to order it than one that doesn’t have a picture at all. Also, the way food smells is another thing that influences my decision on what to eat. When something smells good I automatically want to try it. Healthy choices and options influence my diet. I try my best to have a balanced diet with grains, vegetables, fruits, and meats. My cultural views also influence my choices when I eat dependent on what kinds of foods are available and my preference. I need to pay attention to what I put in my body such as avoiding processed and junk foods. I usually look for foods that I can actually read the ingredients to or when I’m out eating I try to get something healthy. It matters to me because I want to eat healthy plus I like healthy foods more anyways. I also love to eat fresh fruit and vegetables a lot. Stores employ a variety of marketing techniques to try to influence us to make unhealthy choices. For the most part, these techniques work. A juicy burger seems much more tasty than a simple salad. However, we should try to eat healthy and strive for including more vegetables in our diet. I feel like the biggest influence on the choices that we make for what we want to eat come from product placement. Product placement includes the packaging, the way the food looks, and the price. Consumers are always drawn to the way a package looks and how easy it is to open. When you walk into a store and the first thing you see is fruit, then often times you want the fruit. If it was pie you would want the pie. My dietary choices are greatly affected by what “looks good”. My dietary choices are generally pretty good as well. I feel that supermarkets often persuade our dietary choices as it is much less expensive to buy something unhealthy, whereas vegetables and fruits are more expensive. No matter what, we should try our best to eat healthier. Many things determine our dietary choices, for me it tends to be what I know tastes good, and of course what looks appetizing. This could be determined by how fresh it looks and the fun colors that might decorate it. For the most part, I used past experiences with food to determine what I will choose to eat. We make the choices of food based on how they look. If they look nasty and not healthy then I would not get it. We need to have healthy food that looks decent to eat. For example fresh foods. Although calorie count and display do influence our dietary choices, price also is a factor in this decision. From personal experience Id rather buy something cheaper and less healthier than something more expensive and healthier for you. My food choices are influenced by the way it will impact my body, i try to stay away from eating unhealthy things on a regular basis . What I am craving and what I prefer influences my dietary choices. I tend to eat something I prefer over trying something new. Also, when I am craving something, I will find a way to have that food. I feel like eating healthy depends on the availability food is at the time. If you are hungry and need a quick bite, you would go to a fast food restaurant, but if you aren’t as hungry, you can go home and make a balanced meal. However, that may take longer and depends on if you know how to cook or if your parents are able to cook for you.